The Vancouver Canucks continued their long road trip with a 3-2 shootout victory over the Devils in New Jersey. Once again, it was the battle of former teammates as Roberto Luongo faced off against Cory Schneider (figuratively and not literally), giving me yet another opportunity to post my latest Canucks music video. But I digress. 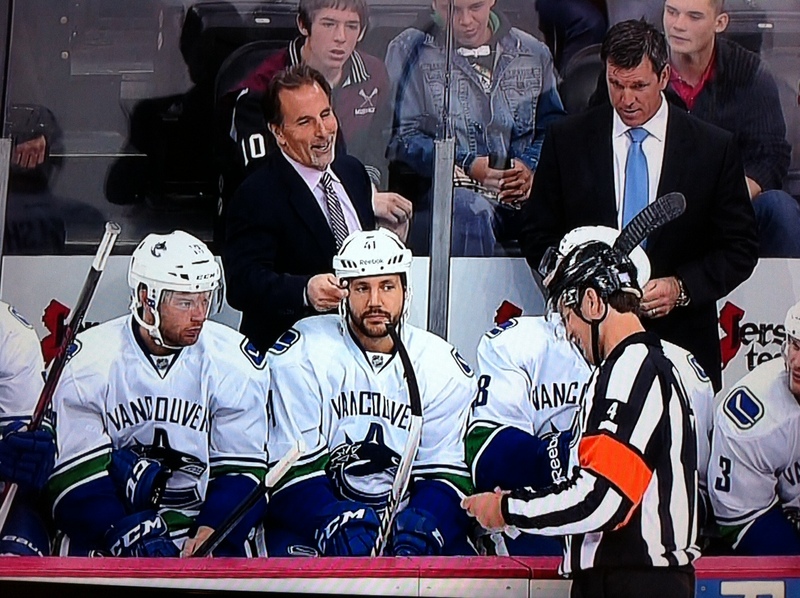 After overtime had concluded, the cameras caught John Tortorella, referee Wes McCauley, and a few Canucks players sharing a chuckle as Torts handed over his shootout line-up. I wanted to leave you with a nice video from after the game last night. With Tortorella as he addressed the media was Liam Traynor and his family. Liam suffers from cerebral palsy and has been friends with Tortorella from back when Tortorella was coaching the Rangers. Liam was featured in HBO’s “24/7 Flyers/Rangers: Road to the Winter Classic”.